Winter Storm Update! Useful storm tips to keep you safe. - Scarsdale Premier Insurance Agency | Advocate Brokerage Corp.
Winter Storm Update! Useful storm tips to keep you safe. Useful tips to keep you safe. As you all know by now, winter storm Jonas is blanketing the eastern portion of the United States. Although forecasts vary, our area could see significant amounts of snow. As your Advocate, we want you to know that we are here for you and would like to offer storm tips and suggestions to help you stay safe & help with claims if needed! Be prepared in the event of power outages. Make sure that…. Check on family members and neighbors who may need a little extra help. Offer to pick up supplies for them. Check your gutters and downspouts and clear any excess debris so that when the snow begins to fall there are no blockages. Be sure outdoor water and hose-bibs are shut off. Dig out your snow gear! Have snow boots & gloves as well as shovels and snow blowers on hand and ready to go. Be sure you have ice melt and salt on hand. Stay off the roads unless it is absolutely necessary! If you need to go out in the snow, dress appropriately and in layers. 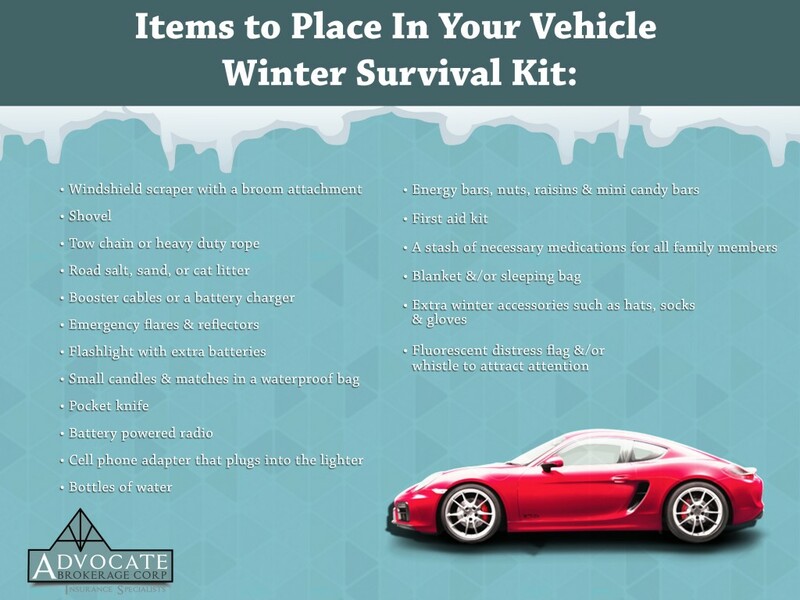 Prepare an emergency kit for your car. We have one below. If you plan on driving remember to adjust your speed and following distances based on the weather conditions. Be on the lookout for ice dams and take steps to prevent them. For more in-depth information, click here. Do not worry if you cannot report your claim right away! If our office is closed, you can report your claim directly to your insurance carrier, all you need is your policy number. Our website lists your carriers’ most up to date contact information. Click here and print your carriers’ contact information so that you have it if necessary. Write your policy number down so that you will have it handy. We work with wonderful carriers who are ready and waiting to provide help if and when it is needed. If you can safely do so, take photos (or video) of the damage. If possible, keep damaged items or portions of these items until the claim adjuster has visited your home.